It's that dreaded time of the year; finals week. Whether you're taking them next week or two weeks from now I thought I'd get a jump on finals week posts! I remember in high school finals week was that oh so lovely reminder that I was going to be a giant ball of stress and nervous breakdowns for about 2 weeks. Late nights studying and cramming notes and every little piece of information you possibly can into your head. Yeah no fun, I've been there done that. I remember that during finals week my outfits were not on the top of my priority. I let being polished and put together slide a little bit but I still wanted to look decent. Dress well, test well was my motto. My outfits during that stressful, chaotic week were ones that I knew were comfortable and I was confident in. They had my favorite, go-to pieces. Today I'm going to be showing you 3 different outfits for finals week. They range from "done trying just trying to get through" to "still looking cute and getting glared at by the other girls in sweats". (My outfits got me the glares.) These outfits are geared towards colder climates [read: Midwest and East] but if you live in a warmer climate A) good for you I'm jealous and B) they can be transitioned. Also these outfits are the epitome of college/sorority/prep/basic /typical white girls but then again unless you're wearing a prom dress to finals I think most outfits are going to fall under one of those categories. Anyways here they are my 3 finals week outfits! Outfit no. 1 is the "I'm done trying I'm just trying to make it through finals and I don't want to wear real clothes but still look socially acceptable" outfit. It also screams sorority/college girl. You've got leggings, Nikes and Vineyard Vines. But hey in her defense it's all suuuper comfortable! Throw on a pullover, vest or jacket and you're good to go. Outfit no. 2 is the "I want to look a little more put together but still can't commit to wearing real pants" outfit. This one is that effortless look. A button down, vest, Converse and leggings create a super cute outfit that looks put together but really you're waaay comfy. Outfit no. 3 is the "Looking like a real human being in real clothes with real pants and getting glares by all the other girls in sweats cause they're jealous that you look so good" outfit. A comfy, cozy sweater, jeggings and riding boots make for a classic chic outfit. Usually I would wear some variation of outfit no. 2 or this one to finals. I was that overachieving girl everyone hated. Haha! 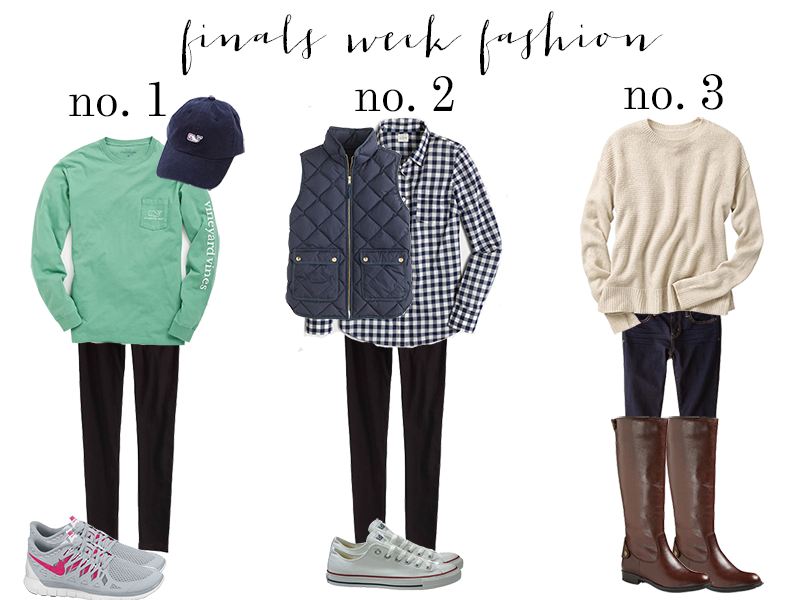 What are your finals week outfit favorites? Are you the laid back type or the dress well to test well type? Leave me a comment letting me know! Happy final's week and Merry Christmas! "the only thing i've learned from finals week is the importance of marrying rich"